Personal & Commercial Sizes Available. Learning Center - What do you need for your Composite Project? What do I need for my Composite Project? The complete ordering guide for your Composite Project. How many times has this happened to you: You're ready to begin your composite project and no sooner than you get started you realize you don't have the right mixing supplies? Or maybe you finish waxing your mold only to realize you don't have any PVA. In order to make sure your project is a success–and make sure you don't waste valuable time and money–compiling a complete list of materials needed for the job is a vital step to any project. Since you're ready to place your order, we are going to organize our ordering guides into a few basic types of composite projects. This way you can quickly find the ordering guide that is most applicable to the project you're going to tackle–whether it's a small polyester mold or a large epoxy part. There are a number of variables that may impact your specific material selections, but we will provide the basic guidelines so that you can tailor your specific materials list to your specific project. Due to the wide variety of products we offer for most of the product categories, we have no way of offering a one-size-fits-all carbon fiber part kit, or fiberglass mold kit. Each part or mold has its own specific considerations and size, the materials lists contained below are meant to be as close to an exhaustive starting point that you can use to plan your project. You may have mixing supplies left over from a previous project, or a few yards of fiberglass that you can use for your next mold. By listing the product considerations common to most projects, we're allowing you to make sure you know what you have or know what you need. If you have landed on this article and have no previous knowledge of composite materials or the typical composites manufacturing processes, you might want to read some additional articles in our Learning Center. 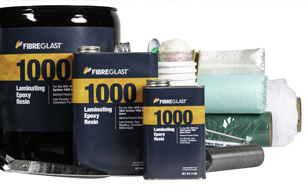 We have other articles that can help with some basic knowledge, including Getting Started in Composites, The Fundamentals of Fiberglass, About Resins, About Reinforcements, and Molding Fiberglass. What are the main types of composite projects? • Epoxy Parts – Epoxy parts have slightly different considerations and materials lists than polyester/vinyl ester parts. You would typically select epoxy resin for structural or high strength parts, so you will definitely want to make sure you have the right materials on-hand. Common applications include high strength carbon fiber and fiberglass parts, aerospace, auto racing, and high performance structural parts. • Polyester Mold – Similar to the polyester/vinyl ester part kit, but there are a few additional things to consider when making a mold. Common applications include room temperature molds for polyester parts. • Epoxy Mold – Again, the use of epoxy resin dictates a different material list than a polyester/vinyl ester mold. Common applications include low distortion/high precision molds, high temperature molds, molds for aerospace and racing parts. Now that we've defined the types of projects, we can get into the materials list for each. Within each, we will define the primary materials– the resin, hardener, reinforcement and associated materials; the supplies and tools–mixing equipment, applicators; the safety/PPE and cleaning supplies–gloves, respirators; and finally the cutting and polishing supplies. Mixing Supplies #588-A Quart Mixing Set #588-A Quart Mixing Set #588-A Quart Mixing Set See our Mixing Supplies category to purchase individual items. Also reference our whitepapers "Molding Fiberglass" for additional information about general part construction. Mixing Supplies #588-A Quart Mixing Set #589-A Gallon Mixing Set #589-A Gallon Mixing Set See our Mixing Supplies Category to purchase individual items. #588-A Quart Mixing Set #589-A Gallon Mixing Set #589-A Gallon Mixing Set See our Mixing Supplies Category to purchase individual items. Also see our whitepaper "Mold Construction" for additional information about general part construction. Applicators #591-A Quart Mixing Set #592-A Gallon Mixing Set #592-A Gallon Mixing Set See our Fiberglass Rollers and Squeegees category to purchase individual items. © 2019 Fibre Glast Developments Corp.